This node creates a terrain plane with an editable inclination and orientation either by specifying the minimum and maximum height values or by adjusting the slope angle. 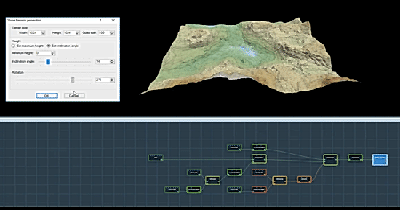 To add a Slope node, right click in the Graph Editor and select Create Node > Terrain Generation > Slope. Click Set maximum height to define the slope with its minimum and maximum heights. Set the Minimum Heights and Maximum Heights of the slope to determine the lowest and highest vertices, respectively. If the values in both boxes are the same, a constant is created. Click Set inclination angle to set the minimum height and inclination angle. 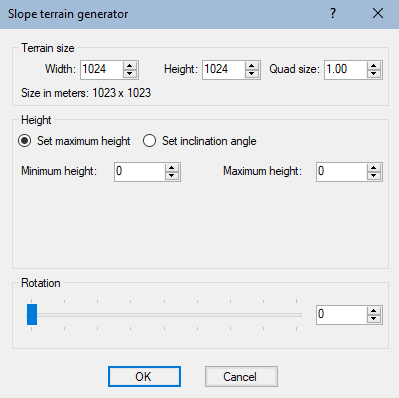 This parameter allows the orientation of the slope to be adjusted easily. Use the Inclination angle slider to set the angle from 0 to 85 degrees between the plane and the horizontal. Moving the slider left flattens the terrain towards the horizontal plane; moving the slider to the right moves the terrain towards the vertical plane. Set the Minimum height to define the lowest vertices of the terrain. Use the Rotation slider to set the slope rotation. The terrain rotates 360 degrees around the center. Watch our Slope node video tutorial.